Recap: The Garden was electrifying tonight! The crowd helped the Rangers off to a great start. Once again we saw the defense only allow 3 shots. This propelled the Rangers to get three goals from christensen, Del Zotto, and Dan Girardi. It is nice to see the Rangers are starting strong when playing at home. Once again it was a tale of two games in the 2nd. The Canadiens scored twice and the Rangers once again looked sloppy. Avery was not a factor at since torts started him off on the 4th line. 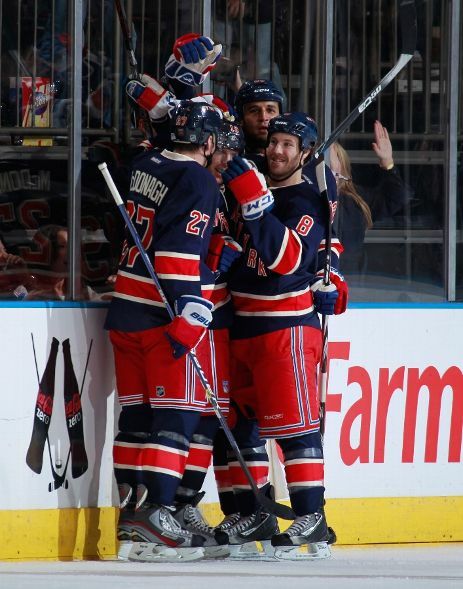 Brad Richards netted the fourth goal for the Rangers. The third was not that much better than the 2nd. Sloppy play and some luck allowed for the Rangers to held a lead until the last final minutes of the game. MTL came within 1 but Ryan Callahan netted an empty netter. Thoughts: by far this was the most exciting game to watch this season. In the opening minutes there was a major brawl leading to 2 game misconducts. Im glad to see that the Rangers were able to score another Powerplay goal but they did not even look good on other chances. During this homestretch the Rangers have been able to beat teams on hot streaks. If this trend continues the Rangers will be a force to reckon with. Yet there is still room for doubt. The Rangers have to be more consistent in their games. They start strong but cannot keep that level of play for a full sixty minutes. If they dont this team will be a .500 team at best. The chemistry is building from game to game but the Rangers are not consitent for a whole sicty minutes. Right now this team does not have a killer instinct yet. They hesitate when leading and along with that lose momentum. The Rangers will have a quick turn around as they play Winnipeg tomorrow at 7 pm. It is there first back to back of the season. They are being tested and it should be able to tell us more about this team. This entry was posted on November 5, 2011 at 9:23 pm and is filed under Rangers. You can follow any responses to this entry through the RSS 2.0 feed. You can leave a response, or trackback from your own site.